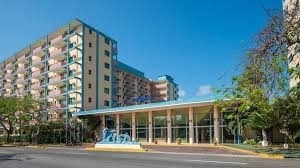 Check out the January 10 departure package to the Bellevue Sunbeach in Varadero, Cuba. It's showing as $282/person after tax for 7 nights! Yep, flight, hotel, food, drinks, etc. Even for a very mediocre hotel that's still a ridiculous price for an all inclusive package. toronto, yyz, caribbean, western caribbean, cuba, varadero, vra and all inclusive deals. One Response to "Last minute all inclusive package: Bellevue Sunbeach Varadero $282/person after tax"
Looks like it's sold out now, congrats to those that got in on it. Crazy price.